Highlighting a fusion of contemporary and transitional style accents, this bed presents exceptional storage space for your home. Featuring multiple French dovetail drawers with Kenlin metal glides, the footboard exceeds all expectations of bedroom accommodation. 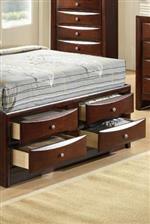 The accompanying headboard showcases additional drawers and two shelves for added versatility. Completed with metal knob hardware and a six step Espresso Lacquer finish, this piece will transform your bedroom space. The Emily Transitional King Bed with Dovetail Drawers by Elements International at Pedigo Furniture in the Livingston, Onalaska, Trinity, Coldspring, Corrigan, Huntsville, TX area. Product availability may vary. Contact us for the most current availability on this product. EM300KRD King Right Drawers 1 0" 0" 0"
EM300KR King Rails 1 0" 0" 0"
EM300KHF King Headboard/Footboard 1 0" 0" 0"
EM300KLD King Left Drawers 1 0" 0" 0"
This collection adds transitional and contemporary style elements to your home. Crafted from various wood solids and veneer aspects, the collection features French dovetail drawers, dust-proof case bottoms, Kenlin metal glides and several unique design aspects. 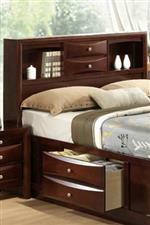 Completed with a smooth lacquer finish, these furnishings add a casual and timeless style to your bedroom setting. The Emily collection is a great option if you are looking for Casual furniture in the Livingston, Onalaska, Trinity, Coldspring, Corrigan, Huntsville, TX area. Browse other items in the Emily collection from Pedigo Furniture in the Livingston, Onalaska, Trinity, Coldspring, Corrigan, Huntsville, TX area.